OzMobiles grew their ecommerce business 1,000% in just 6 months. A mixture of a high converting ecommerce website & ROI-driven digital advertising. 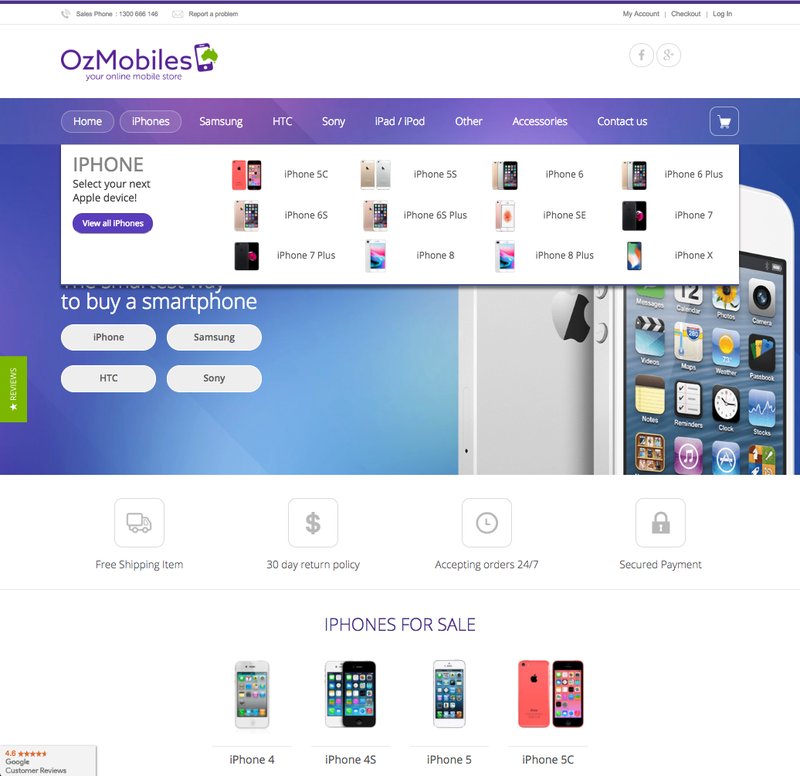 OzMobiles started on eBay, a platform where they were a power seller. Their web presence however was not seeing the same success. Owner and serial entrepreneur, Tim Duggal engaged JMarketing to grow the website sales into an industry powerhouse. OzMobiles entered the market competing on price. They knew their margins and would bend over backwards to provide the best value solution, often upgrading people to a higher specification of phone for the same price they were willing to pay” with “at no extra cost. The core limitation for OzMobiles was consumer trust. This is common for ecommerce retailers. If a consumer doesn’t know you, they often will not purchase from you, even if you are 10% cheaper than the next guy. This is even more true in the phone industry, where phones have become not only essential communication tools, but a quasi status symbol also. Our solution was to work with OzMobiles across several fronts. Essentially rebuilding the way they engaged with their customers, we reshaped their entire digital presence. From start to finish took around 6 months. The results were immediately obvious, and whilst there is always some teething issues, most of these came from growing too fast. That’s the right sort of problem to have!! The advertising was heavily geared towards customers seeking specific products. As a result, a huge amount of traffic was landing directly onto the product pages. Thus, these were our first point of focus. We knew OzMobiles was successful on eBay because of reputation. Our working theory was that by mirroring this trust and authority, we could spike conversion rates and drive down the cost of client acquisition. Supporting this logic, the competitor analysis was quite confronting. Whilst there were others competing in the market, they put little if any effort into proving their trustworthiness. As a result, the big telecommunication companies were owning the market. 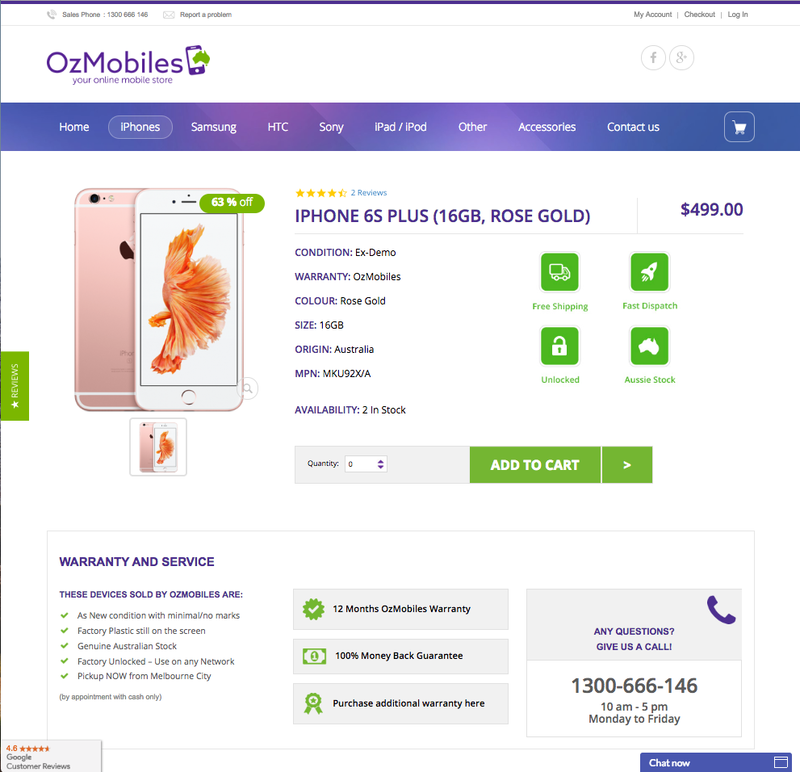 The landing pages we created catapulted OzMobiles sales rate ahead of the pack. The use of proof-points and dense product information was a foundation for success. We also created a one click system, allowing OzMobiles to quickly add a full 1,000 words of content about the quality of the phone, returns policy and other such information. What we learned, was that these customers simply wanted to navigate to the phones of their choice as quickly as possible. To deliver on this, we stripped away a lot of the branding elements, and pushed the ‘about us’ information further down the page. The core goal was navigation. As you can see in the design, the visual menu structures (including the primary nav which is not visible in the adjacent image) quickly direct customers deeper into the site. The easier we made this, the lower the bounce rate and the more customers we pushed into the purchase decision stage of the sales funnel. Tim Duggal is a serial entrepreneur in the telecommunications industry. When he started OzMobiles, he consulted with JMarketing and built a plan for launch. Once the business gained traction, he started working with us closely, strategising each expansion step. The company has grown from a startup to an thriving powerhouse. There are few price shoppers that don't know about OzMobiles and the consistent value they offer. Even when running out of stock, OzMobiles always keep the customer in mind first, and keep their prices below industry rates. Within 6 months, OzMobiles revenue had grown by 1,000%. This was off an already impressive base. Moreover, the cost of new client acquisition continues to fall. For privacy reasons we can’t share these numbers, but we can say it was hugely impressive, and ROI positive. The core result came from having Tim having faith to invest in foundation. One month after launching the new website, and revenue had increased 100%. This was driven by higher conversion rates, primarily from users landing directly on the product page and making the immediate decision to purchase. Over time, we worked with OzMobiles to not only target end sales, but to start building a brand. We invested in following shoppers post-purchase across multiple networks, showing them up-sell opportunities to enhance their past experience. Over time, OzMobiles grew a reputation for aggressive pricing and customer service excellence. JMarketing worked across every area of the business, and proudly share this case study as what a company can do when they invest in themselves. Each month we analysed the strengths and weaknesses of the business, and each month OzMobiles invested in improving. Steadily their business improved, and the industry leader that is OzMobiles emerged. If you want to grow your ecommerce business, the first step is investing in your foundation. Talk to our team today about what the right steps are for you. The service and output are always of the highest standard with JMarketing. Nothing is ever a problem, they're a solutions-orientated team and very good at what they do. FireBelly continues to partner with JMarketing to deliver great results in both development and website performance for our clients. Highly recommended. Top notch service - very thorough - left no stone unturned - highly recommend! Very responsive, friendly service. Solved our hacking issue quickly and implemented a great plan for future security. Before Josh started his business - he met me for regular coffee's for free just to get help me get started as he was passionate always about anything Google related. He always goes above and beyond, because he's passionate about learning more, and growing together. Oak Room Wines have been working with Josh and the JMarketing team since 2014 when our first project was a migration and site rebuild from Big Commerce to Wordpress & Woo Commerce. The unique combination of Josh's' technical, analytical and industry knowledge and ability to communicate and coordinate this onto creative and development teams is amazing. Personally I have a passion for ecommerce and digital marketing having spent many years in the industry but when I need help on my own business I turn to JMarketing. In fact this Christmas period our new homepage and advertising strategy was so good I haven't had time to log into Analytics or adwords and medal with the account (something I have been guilty of in the past! ), it has been solely trusted to the JMarketing team with confidence. So If you are looking for a global digital marketing partner with a unique mix of skills to take your business to the next level...Call Josh & the JMarketing team!